I feel like it's my duty every fall to remind you about Honeycrisp Apples. You can only get them for a couple of months in the fall. Which makes them even more appealing. And I have expressed my love for Coke and donuts and anything sugar, enough for you to know that if I am singing the praises of an APPLE, it has to be yummy! Yesterday was the opening day of Hall's Pumpkin Farm. We stopped by for a second last night, but it was raining, so we didn't stay long. This picture is from last year. The Golightly's are selling delicious BBQ there, so go hungry. The farm also has hayrides and a corn maze. Its' a fun place to take pictures too! We will probably visit several times in the next month! After getting soggy at the pumpkin patch, we went out to eat. I loved this high chair. It was cut down, so it could fit in the booth! Katie's not quite ready for a booster seat yet. I love the confinement of a high chair. It's nice to have your 2 year old strapped in! Marcus and Katie were "cheersing" their rolls. Today Marcus brought home this funky pumpkin from Walmart. I kind of feel like this is what my face looks like right now! I am a little bit perturbed that I have to use zit cream and wrinkle cream at the same time in my life! I feel like it's counter productive. Maybe I should quit both? At least the pumpkin is cute! 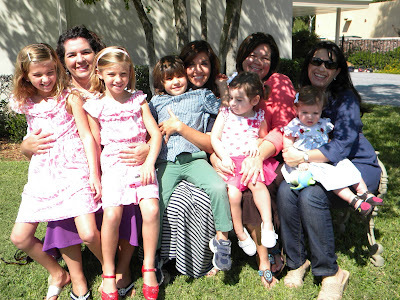 Moms don't usually get traditional weekends, but that's OK, because we get donuts! When Marcus got home from work this morning, we just hopped in his truck, to go get donuts. We always do a little driving around too. We are always on the look out for our next house! We saw some horses and cows today! We don't live in a rural area at all. We are right in between Dallas and Fort Worth, but this is Texas after all, so I guess livestock is welcome anywhere. It made the drive more exciting! You still have time to celebrate Donut Friday! Enjoy! We are still sporting summer clothes around here. Katie got this cute dress from Staci, so I wanted to document it for her. I think it will still be cute in the winter with a shirt and leggings under it too. I can't even imagine WINTER right now? And her pretty pearl bracelet was a 1st birthday gift from my friend Susan. I am so blessed to have such generous people in my life! Katie would just be wearing a diaper and bow if it weren't for them! And I think Katie reads my blog! Remember yesterday when I was talking about Love and Logic? And how I am less frazzled and more civilized when it comes to disciplining her? Well, she wanted to test that today and prove me wrong! And she totally did. 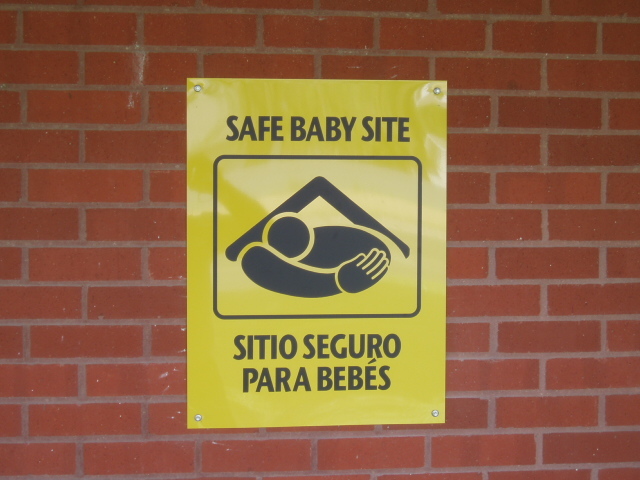 In Texas, we have safe baby drop off sites. You can drop off your newborn if you don't feel like you can care for it. No questions asked! Fire stations are all drop off sites. I don't think they take 2 year olds though! Katie and I made up and we are friends again. So I will keep her. And I think she still wants to keep me too. I put her to bed an hour early, because I could tell she was super tired. She fell asleep in about a minute! I am hoping that she won't wake up an hour early now. I just got back from The Love and Logic class I am taking with my sister on Wednesday nights. As heartwarming as our annual trip to the local apple orchard each year, our delicious fall blend fuses mulled cider and warm caramel with a hint of sweet cinnamon. I want my house to smell like fall even when it doesn't feel like it outside. And we have gone a little over a week without this toot invading our house! Picture it in a sassy 2 year old voice! Well, one day we heard Caillou in the background in that exact sassy voice saying that exact sassy thing! Katie picked up his inflection and brattiness! We don't need that kind of influence. So we told her he's in time out right now for not talking nice. She has totally accepted that! Also their home decor always bugged me, but that's not really relevant, is it? We did watch Peppa Pig today and I liked it, because they laugh at just about everything, even when something doesn't go their way. And they usually fall down, because they are laughing so hard! So cute. 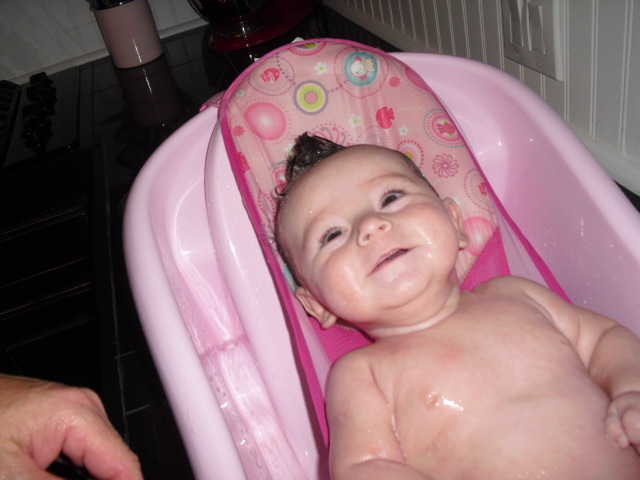 It makes Katie giggle when she sees them giggling. It's a crying shame that pigs have better manners than a 4 year old boy! 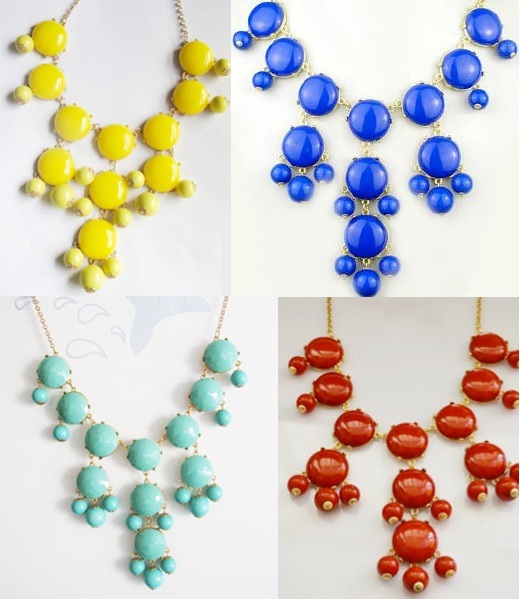 I think I finally found a wholesale vendor from which I can order some bubble necklaces! This is just a sample pic I got from the internet. I think I will be able to get a lot more colors! My plan is to sell them at Golightly's and maybe some on my blog too if anyone is interested. What I want to know from you is what colors should I get and what price do you think is fair? They are $150 on the J.Crew website and that is 100% crazy! I have never had $150 to spend on a necklace! If you have, then I am so happy for you! My taste changes too quickly to spend that much anyway. And last, but not least, my friend Staci is doing an Erin Condren giveaway on her blog! I really want to win, but I guess you can enter too if you want! BUT before you go there, please answer my bubble necklace questions! Really I would say Happy Fall, you guys, but it doesn't rhyme! I was raised by Yankees! Tomorrow is the first day of fall! I wish it would drop 20 or 30 degrees! I got all my fall stuff out last week, because I had some girls over for dinner and I wanted to be festive! They are some of my mom's teacher friends, that are now my friends too. Whether they like it or not. I wish I got some pics of them, because they're pretty cute. Marcus made us a big breakfast for dinner and it was delicious! And Katie has been in Heaven having candy corn right out in the open! At least it's a vegetable! Have a happy fally weekend! I am usually a big fan of change. I don't like routine, but this new blogger set up is not my cup of tea! I was used to the old one and I don't like reading directions, so this will take some getting used to. For those of you that don't use blogger, it is now "updated" and "better". Blah! To me it's just harder and different. So, I have ignored my blog all week and now I have to catch up. I started my week off with going to the dentist and the DMV in the same day. At least Marcus had to renew his license too, so we were in it together. We didn't want to leave Katie out of the fun, so she came too. I downloaded some puzzles and other apps on my kindle, so she thought the DMV was lots of fun! I am not going in chronological order. I hope that doesn't upset anyone! Katie was in awe! She still has her hand over her heart from the National Anthem that was sung 10 minutes earlier! 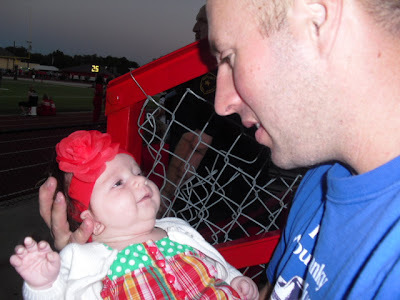 This was taken at her first FWC game 2 years ago! Last week was "blue" day at school. I struggled to find something blue Katie could wear. This is the outfit I came up with and Marcus kept laughing at her because he thought it looked like something I would wear. He's right, I totally would. Minus the pig tails and bow! And this was this morning. Katie has her own air bag. She really wanted to take her pink ball to Nonni's house. They played with the pink ball while I went and got a pedicure! That was way more fun than the dentist and DMV! 11 years ago yesterday Marcus and I were at a time share in East Texas about to leave on our way home. We were watching the news and saw the first tower burning and then saw the second tower get hit. It was surreal. It didn't even register that it could be terrorism. I thought maybe some air traffic controller guy got confused? Then as we were driving home, no music was playing on the radio. It was just people talking and news feed. We heard about the other planes crashing too. I kind of felt like we should stay in small town Texas, because we might be safer there. Dallas is a big city and I wondered if something was planned for here too? It was scary. I wish I had some great poetic words to say about it, but it was just senseless and sad. And of course, I think a lot about the fire fighters, and what awesome super heroes they were that day and the days after. I just had to acknowledge the day. Katie wore a version of red, white and blue yesterday. Yesterday while she was at school I organized her gigantic mountain of clothes that no longer fit. And put them out to sell. I traveled down memory lane with almost every piece of clothing! I held up some new born things for Marcus to see. He kept saying, "There is no way she fit into that." There is no way I could have gotten it all done with out my mom's help. She ironed almost everything. It was all smushed in Space bags, so it got pretty wrinkled. It's been fun having friends come by and "shop". Unfortunately, Katie was a toot when people came over! When she is with family, she is always kissing and hugging us, and says sweet and cute things. (most of the time) THEN, when we are around others she tries her hardest to humble and embarrass us! And make it look like we haven't ever attempted discipline! Here she is with one of my friend's daughters. They are eating goldfish with their blankies. Goldfish can usually keep the peace for a little bit. THANKFULLY, I just started going to a parenting class tonight with my sister. It's called Love and Logic and Katie's pediatrician is teaching it at her church. I hope it can make me at least LOOK like I know what the heck I'm doing! I think all children are a blessing from the Lord, even boys and even boys that are hyperactive. My point was that I have a super easy girl right now and sometimes I feel like that is all I can handle. Some of the biggest blessings in my life are when God gives me the exact opposite of what I think I want. That's kind of what I meant about Him being a prankster. My most favorite person in my life is a boy and I am glad he was born, so I could marry him. I am so sorry if it seemed like I would be ungrateful to have boys. I would be so grateful, just scared! And I don't want to be insensitive to parents that have kids with attention deficit hyperactivity disorder. I feel like any parent would say they wouldn't want their kids to struggle with that. Sometimes I am flippant and silly with my words and I am truly sorry if it hurt any of you. And God knows my heart and He knows that I want what He wants. Even if it's 10 boys. Also, God gives us the desires of our heart according to His will. Right now I desire to be a mom to just Katie, and that' s OK, because right now that's God's will. I have heard TONS of moms say that they are so glad they don't have a girl or don't want a girl, because of the drama and the teenage years. I say, "BRING IT". I love teen aged girls and I am so excited for that stage. God made us different with different desires. We need passionate boy moms and passionate girl moms and moms who are blessed with both. My intentions were not to disrespect or insult anyone. Those are NEVER my intentions. I regret that I did both of those things. I've decided to sell all of Katie's baby stuff. It's all taking up way too much space. You all might be wondering if we are done having kids? I wonder the same thing. Only God knows. We will leave it up to Him. I am SO HAPPY with one child. She is a joy and a blessing! The only part of me that wants another baby is so that Katie will have a sibling. I love having a sister and I know Katie would love it too. It's kind of a gamble, because God could give me twin boys with ADHD. Anyway, everything is pulled out and ready to sell. BUT Katie thinks it's all new toys for her! It kind of makes me want to shed a tear! And take a bite of those cheeks! And then she spent at least 30 minutes in her swing! She saw the tray and requested a snack! This swing was a life saver in the beginning. 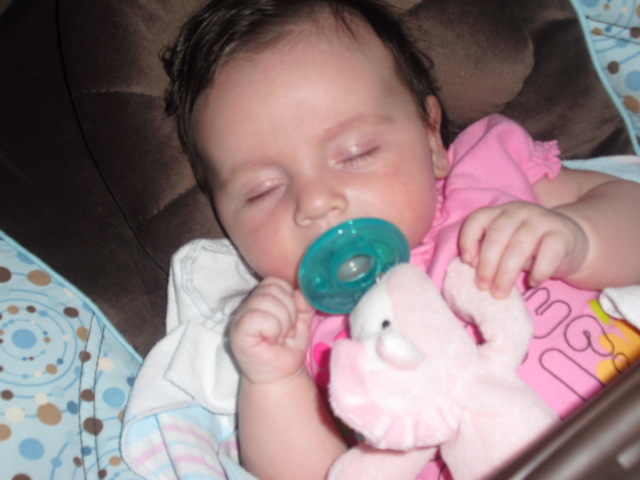 I miss that tiny baby, but I do prefer sleeping all night though, so I will get over it! It will be nice to clear some things out! If I end up pregnant, please send me your hand me downs! And if I end up pregnant with twin boys...we'll know that God is a real prankster!